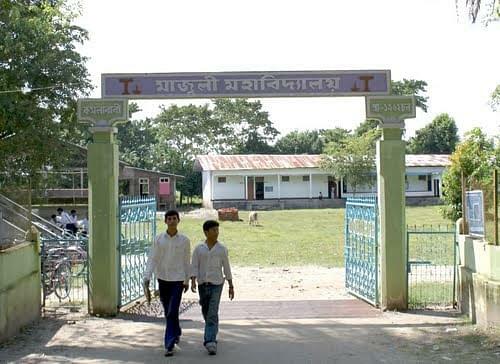 Locted amidst rivers of Majuli district near Jorhat, Assam, Majuli College is one of the few premier colleges of Assam. This high learning college has grown up into a pioneer educational institute through its dedicated efforts of governing body and eminent faculty members in last 52 golden years. It is well-equipped with adequate infrastructure including massive library to foster the educational needs of students and staff. It s dedicated career guidance cell provides industry based training to its students by organizing GDs, Interviews etc. Majuli College is offering University guided under-graduate and Post Graduate courses in Arts, Science and commerce via regular as well as distance learning modes. The institute has served its glorious 50 years in the upliftment of the students of North-eastern states and is still standing tall with pride. Modern Library stocked with vast collection of 15000 books, periodicals, CDs, journals & 2 Regional Newspapers. Well equipped one Computer lab with latest instruments and gadgets. 2 storey building for Girl students. Cultural, sports, educational tours etc. 1 hour 30 minutes from Jorhat Airport, Assam. To commute via bus from ASTC, Jorhat to Kalambari, it takes about 1 hour 21 minutes and then ferry services are hired to reach to college. Why to Join Majuli College? Majuli College is a distinguished educational institution in whole of Assam because of its excellent academic standards and placement assisting programs. It provides the right platform to groom these students at both academic as well as co-curricular fronts. The College has an Anti-Ragging Cell and Women Cell to address any anti-social issues of the students and take strict disciplinary action against them.